In his annual report, Ofsted chief inspector Sir Michael Wilshaw has praised Bondholder Derby College. The College’s work with the local business community, as well as its work with high needs learners, were both deemed as ‘Outstanding’ by Ofsted following their inspection visit to the College. The Ofsted annual report highlights the College’s successes in bridging the gap between education and employment. The case study outlines Derby College’s success in forming partnerships with employers to create employment and skills and employer academies. It describes how these are made up of a group of local employers from specific sectors as well as individual employers who have a dedicated cohort of learners without their academy. The College has 15 employment and skills academies across as many sectors with 300 active board members who assist with curriculum design and delivery. Derby College Chief Executive Mandie Stravino commented: “Our work with employers was particularly singled out for praise by Ofsted and we are delighted that our work has been highlighted as the main case study in Sir Michael Wilshaw’s annual report. “Our role as a College is to provide learners with the skills, attitudes and employability skills to progress onto the next stage of their lives – whether that is to higher education, work or self employment. Bondholder Mazars has been awarded the Top 50 Tax Team of the Year award at the 2016 British Accountancy Awards. Senior Partner of Mazars UK, Phil Verity, continued: “Tax has always been an area that Mazars is known for. Tim and the rest of our UK tax team continuously work hard to deliver our services in a positively different way. Bondholder intu Derby has been named the East Midlands' number one shopping centre, according to research conducted by Trevor Wood Associates. The ‘Going Shopping 2017 – The Definitive Guide to Shopping Centres’ sees the Derby shopping centre ranked highest in the region, and 16th overall in the country. Adam Tamsett, General Manager intu Derby, said: "We are delighted to hear that intu Derby has been ranked the best shopping centre in the region. The last 12 months have been an exciting time for the centre with the opening of a number of new stores including Cath Kidston, New Look Men, Toys R Us and BB’s Bakers and Baristas as well as new restaurants including MEXIco and Carluccios. As well as this, work is well underway on a fantastic leisure development which will see Hollywood Bowl and Paradise Golf open at intu Derby in Spring 2017. The tables are compiled by looking at shopping centres currently trading and ranking them by overall attractiveness to shoppers, retailers and investors. This was achieved by confirming detailed information for each scheme thought to be larger than 50,000 sq ft in the United Kingdom. The information is then converted into points for selected features shown to be important to those groups, including tenants, lettable area, type of scheme, weekly footfall and facilities available. Heather Gunn, Marketing and Audience Development Coordinator at Bondholder Déda, has won The Marketing and Leadership Academy’s (TMLA) competition to gain free tuition for her final studies at the training academy. Heather is studying towards her Professional Diploma in Marketing for the Chartered Institute of Marketing (CIM) at fellow Bondholder TMLA. A Déda spokesperson said: "The Déda team is extremely proud of Heather for winning this TMLA competition. We recognise the tremendous effort which Heather is putting into the course and this is a great boost for her, with the finishing post in sight next week when she hands her final assignment in. Gaining this Professional Marketing qualification will of course be a significant achievement for Heather, but will also bring new expertise into Déda allowing us to develop the Marketing function throughout the organisation." Bondholder Smith Cooper has been recognised by Sage as the Sage’s Midlands Region, Business Partner of the Year. The award was presented to Directors Richard Brewster and Chris Smith at Sage’s annual awards ceremony, and confirms Smith Cooper’s status as the most active Sage 200 provider in the Midlands region. Chris Smith, Director, said: “I was genuinely surprised when we won this award last year and really thought it would be tough to repeat the achievement again in 2016. Bondholder Rolls-Royce has been voted Britain's best company to work for. In a survey carried out by the world's largest job site, Indeed, the engineering icon was voted the UK’s best employer, compiled from millions of employee reviews. Rolls-Royce employs over 14,000 people in Derby, and has its Aerospace and Nuclear divisions headquartered in the city. Daniel Perkins, Global Employer Brand Manager at Rolls-Royce, said: “At Rolls-Royce we recognise that our people are our power. We are therefore extremely proud to be named by Indeed as the best place to work in the UK. "We employ over 23,000 people in the UK across a huge variety of roles, functions and business areas. This includes over a thousand apprentices and graduates and we work to create an environment where every employee can reach their full potential, encouraging diversity, engagement and development." Bill Richards, UK Managing Director at global job site, Indeed, comments: “While the need to earn a salary is the imperative that makes us go to work, it’s far from the only criteria we judge work on. “Benefits and workplace flexibility play an important role in workplace happiness, but they’re not the key determinants of what makes an organisation great. For most employees, feeling valued, a positive company culture and quality management matter more." The full listings can be found here. Bondholder Gleeds has been awarded Construction Consultant of the Year at the Building Awards. Held in London, and hosted by Building Magazine, the annual awards ceremony is one of the most prestigious in the built environment calendar, and celebrates the best of the UK's construction industry. The judges looked at Gleeds' projects, the company's commitment to staff training, and sustainable growth. Bondholder housebuilder Radleigh Homes is celebrating a double success at this year’s prestigious International Property Awards. 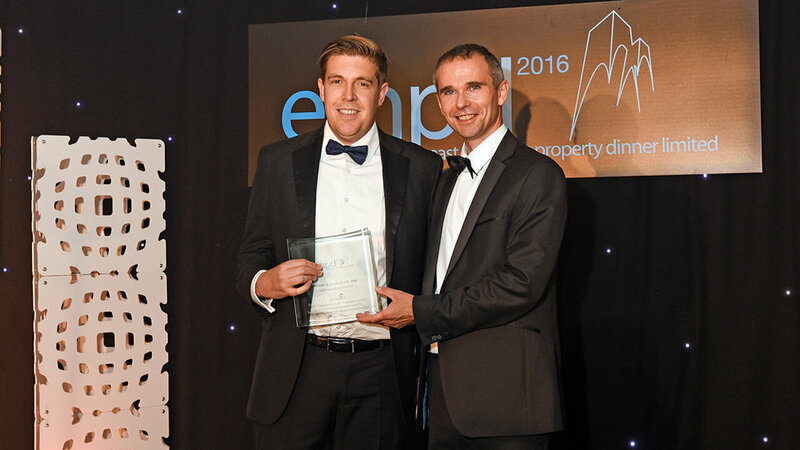 The company has scooped the Best Residential Development in Derbyshire award for its scheme on the Broadway in Derby and was highly commended for its new Weavers Point apartments on Lodge Lane. Bondholder company On Event Production Co. is celebrating after scooping one of the most prestigious accolades in the industry. The live events company scooped the Production Award at the Event Awards, which took place at London’s iconic Hammersmith Eventim Apollo in the presence of more than 900 of the industry’s key leaders. The award follows a busy 12 months for the company during which it has relocated to a new, purpose-built premise in Castle Donington and expanded its operation with a series key promotions and appointments. Bondholder Derby Brewing Company has won the gold award for one of its new craft-style beers, ‘Drop It Like It’s Hop’ at the SIBA’s Midlands Independent Beer Awards. The beer ‘Drop It Like It’s Hop’, a 4.5% American Pale Ale, was entered into the category for Premium Bitters and Pale Ales, and beat out stiff competition. Paul Harris, Director of Derby Brewing Company, said: ‘’We’re really pleased that one of our new craft style beers have been recognised by SIBA and to win a Gold award was fantastic. There is a lot of strong competition from other breweries so win gold from all these entries is excellent. SIBA hold regional and national awards every year and they are a great opportunity for breweries to be recognised." Bondholder Purpose Media has been nominated for an award for its work on fellow bondholder Blueprint Interiors’ new website. Purpose Media was appointed by office design and fit-out firm Blueprint earlier this year to develop its branding and presence online. The project has been shortlisted as a finalist in the ‘Digital: Website’ category in the 2016 Drum Cream Awards. The awards, organised by marketing industry magazine The Drum, aim to recognise the very best creative advertising and design talent across the Midlands, East, South West and Wales. The winners will be announced at a gala awards evening in Birmingham on 16 November. Purpose Media managing director Matt Wheatcroft said: “We’ve had a fantastic year at Purpose Media, after doubling our staff headcount and turnover and winning local and regional Chamber business awards which have put us in the running for a national British Chambers of Commerce award, so to be up for a Cream award as well is just the icing on the cake." Blueprint Interiors creative director Chloe Vickers added: “2016 has been a fantastic year for Blueprint, we’ve streamlined our company process and brought in seven new staff to increase our offering to our clients. Our website has been critical in showcasing and celebrating our work, our process and our values. Derby's Cathedral Quarter has been shortlisted for a national award to find Britain's best high street. In recognition of Bondholder Derby Cathedral Quarter Business Improvement District (BID)'s, work to revitalise the area, the Cathedral Quarter has been shortlisted in the city location category of the Great British High Street Awards. The competition celebrates the great work that is being done to revive, adapt and diversify the nation’s high streets. The public has now been asked to vote for their winner between now and November 18. If successful, the Cathedral Quarter will win a share of a cash prize pot, and dedicated support and mentoring from industry leading experts, including Google, who's expert training taskforce will provide training on how to make the most of their digital skills. Martin Langsdale, chair of the Cathedral Quarter management group, said: “It is a huge honour for the Cathedral Quarter to have made the top three in the city location category in the Great British High Street competition. “We are delighted to have reached the final but we now need support from everyone in the city and beyond to help us really put Derby and particularly the Cathedral Quarter on the map." To vote for the Cathedral Quarter, click here. Bondholder company Gravity Digital scooped top prize at the Rural Business Awards - the UK's only dedicated national business awards for the rural community. The digital marketing agency were the outright winner in their category for Best Creative Business. Awards co-founder Anna Price said: “Gravity Digital was, we felt, quite simply a very professional and well established creative business with strong rural roots. "We were very impressed with its down to earth approach, 100 per cent client retention rate, and structured and proactive programme of community and charity-based initiatives benefiting the local area. Well done Gravity - a clear winner in this category. Bondholder company Toyota Manufacturing UK have celebrated the production of its four millionth vehicle at its plant in Burnaston. Early Tuesday morning, an Auris Hybrid became the four millionth car to drive off the assembly line, 24 years after the start of UK production in December 1992. The first vehicle to drive off the Burnaston production line on the 16th December 1992 was a Carina E.
The University of Derby's News Team scooped double gold at the Chartered Institute of Public Relations (CIPR) PRide Awards, walking away with awards for Education Communications Campaign and Outstanding In-House Public Relations Team of the Year. The Bondholder company competed against more than 250 public relations professionals from across the Midlands, but the judges deemed that it was the team's clear and focused approach that made them the clear winners. The team won the gold in the Education Communications Campaign category for their Guide to Expertise. The campaign brings together media-friendly experts from the University, providing comments on everything from zombies to politics. Bondholder Derby Cathedral Quarter Business Improvement District (BID) is in the running for a national award. In recognition of the BID's work to revitalise the area, the Cathedral Quarter has been entered into the city location category of the Great British High Street Awards. The competition celebrates the great work that is being done to revive, adapt and diversify the nation’s high streets. Martin Langsdale, Chair of the Cathedral Quarter management, said: 'The Great British High Street recognises that city centres are a vital part of our community and make an important contribution to the economy through the billions of pounds they generate and the thousands of jobs they support. A student accommodation scheme, delivered by Bondholder Prosperity Capital Partners, has been shortlisted for a regional award. Cathedral Court has been named as a finalist in the East Midlands Forum for the Built Environment Awards, which recognises the teams behind the region's best construction projects. Situated on Cathedral Road, the accommodation offers the latest in premium student living for more than 350 students and has been nominated in the residential category.